Want the best deal for insurance coverage? We compare Takaful and conventional insurance to help you decide which is best for your needs. Here is a complete guide on Takaful insurance so you can broaden your insurance options. Takaful is Shariah compliant insurance option which is grounded in Islamic Muamalat (Islamic transactions) products. This means under Takaful there can be various Shariah compliant products such as medical Takaful, motor Takaful and more. The term also refers to the concept of Islamic insurance based on mutual cooperation where both risks and funds are shared. Mutual financial aid is provided through the Takaful pool known as Tabarru’ (funds) which are collectively contributed from a group of people who choose to be covered under Takaful. The first Takaful company in Malaysia was established in 1985 following the enactment of the Takaful Act 1984. Malaysian Takaful Association (MTA) is the body of reference for all Takaful related matters in Malaysia and the Takaful industry in Malaysia is also regulated through the Islamic Financial Services 2013 act. 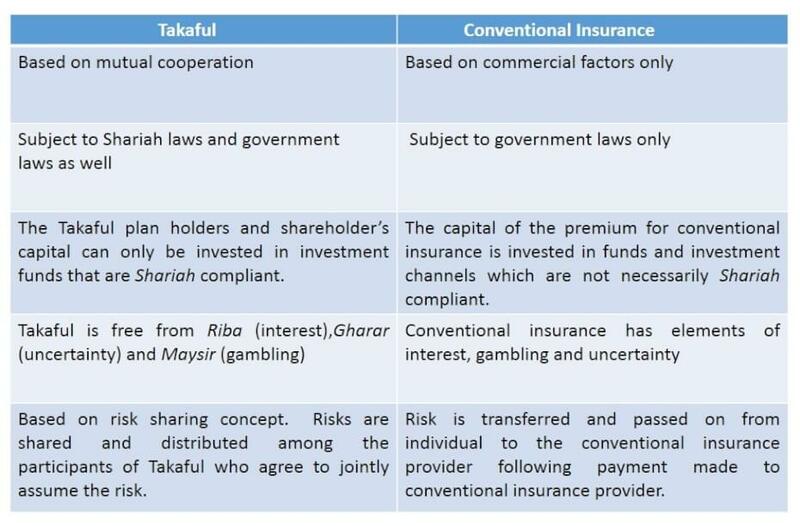 Mutual risk sharing – instead of passing the risk on to an operator like conventional insurance, the risk is shared by everyone under Takaful. No claim cash back policy – if you don’t make any claims within the coverage period, you will get a certain amount of cash back from your Takaful provider. The amount however, is decided upon by the Takaful provider and there is no set amount to adhere to. Shariah compliant – it must adhere to all Islamic laws and not involve anything Haram. There are two types of Takaful which is family Takaful and general Takaful and then there are various products under both Takaful. Family Takaful: provides both protection policy and long term savings for you and your beneficiary. Investment – Linked Takaful: family Takaful that is combines investment with Takaful cover. Investment will be in Shariah approved investment funds. Medical & health Takaful: gives coverage for the cost of private hospital medical treatment and hospitalization. Child education Takaful: this will provide your child financial protection should you suffer from disaster such as permanent disability or death. At the same time, this Takaful product also offers long-term savings for your child’s higher education expenses. Motor Takaful: third party Takaful protects you against loss or damage to a third party vehicle due to accident, theft or accidental fire. It also covers loss or damage of third party’s property, bodily injury or death. A comprehensive Takaful coverage protects you and third party against injury and property damages caused by accident, theft or accidental fire. Home Takaful: there are two types of home Takaful which is the houseowners Takaful and the householders Takaful. Houseowners Takaful provides coverage against loss or damage caused by floods, fires and other risks. Householders Takaful cover the loss or damage to the content of your home. Personal accident Takaful: provides you and your beneficiaries with compensation in the event of death, injuries or disability from an accident. Takaful is open to everyone, and one does not have to be Muslim to take on Takaful coverage or to be a Takaful agent. Lack of awareness may be the reason behind why people think Takaful is only meant for Muslims when in fact Takaful is broad and borderless. So people need to know that they are other types of coverage they can explore aside from conventional insurance coverage. The idea of Takaful is similar to conventional insurance and shares the same fundamental roots. Both Takaful and conventional insurance aim to provide individuals as well as corporate bodies from loss and hazards. There is a common objective of both Takaful and conventional insurance which is an aim to reduce financial burden that arises in the event of disasters or loss. Before you sign on the dotted lines for a Takaful insurance coverage, check if your agent is registered as a Takaful agent with MTA. This is to ensure you don’t get cheated by unscrupulous individual posing as a Takaful agent. Do take note that all Takaful agents are required to register with MTA before they are authorised to promote and distribute Takaful products. All registered Takaful agents will be issued with an authorization card. You can verify an agent’s registration status with MTA through the agent search section on MTA’s website. You can also have a look at the full list of licensed Takaful operators in Malaysia from Bank Negara Malaysia’s (BNM) website. Are you looking for a Shariah compliant credit card that comes with Takaful coverage? Compare Islamic credit cards for free on CompareHero.my and get the best deal today!